3 predictions for week 5 of college football, 2013. We’re at a transition point with my analysis. With four weeks gone, I have enough data to rank teams based on only data from this season. All 125 teams are now connected by games. I no longer need data from last season that could bias the results. However, my rankings with only data from this season are noisy. The figure shows the top 10 teams in my team rankings. There is no chance that Oregon is 53 points better than the average FBS team. Over the last 30 years, the 1995 Nebraska team had the largest rating at 41 points. Baylor as the second best team in the nation? Not with a schedule that includes Louisiana Monroe and Buffalo. Mizzou in the top 10? I have respect for Gary Pinkel, but let’s not get ridiculous. My rankings are incredibly noisy at this point in the season. Hence, my team rankings and predictions still use games from last season. My offense and defense rankings by yards per play are also noisy. We just have to live with it. Let’s look at some games. Note from Ed, Friday, September 27th, 2013: I’ve been tracking my picks on the Onside Sports app, a beautiful sports app for iPhone and Android. I’m 5-4 through last night. This week, I feel so uncertain about the 3 games below that I’m not picking any of them on the app. When Stanford roughed up San Jose State 34-13 in their opener, the Cardinal were on track to live up to their preseason hype. San Jose State had almost beaten them last season. However, San Jose State gets beat up at Minnesota, and suddenly the Cardinal don’t look as hot. The offense has not been elite this season, ranking 29th in yards per play adjusted for schedule. They face a surprising Washington State defense that ranks 11th. Stanford’s defense has been great, ranking 13th and continuing to have a party in the backfield every game. They should be able to lock down Mike Leach’s spread offense. However, you never know when the offense will click. The game will be played in Seattle, so Washington State also has to travel for this home game. However, I see this as a danger game for Stanford. They should win, but not by a lot. Wisconsin likes to run the ball. Behind a physical offensive line, 63% of their plays have been runs this season. 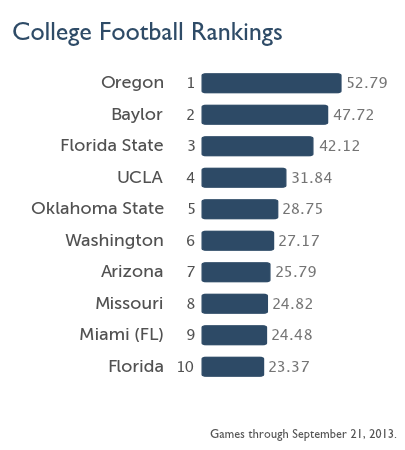 Moreover, the Badgers are 1st in rush offense by yards per play adjusted for schedule. Can Ohio State’s rush defense match up? They have only allowed 3.4 yards per rush this season, 9th best in the nation. However, they have played 4 teams that do not run the ball well. My adjustments for schedule put Ohio State’s rush defense at 94th. That’s most likely too low. But the true strength of their rush defense will play a huge factor against Wisconsin. The line favors Ohio State by 7 while my team rankings have the Buckeyes by 5.8. Alabama beat Colorado State 31-6 last weekend, but the game left plenty of doubts about this year’s Crimson Tide. Colorado State threw for 5.7 yards per attempt (221 yards on 39 attempts). The FBS average is 6.4 yards per attempt. Alabama’s defense let a cupcake walk into Bryant Denny and throw the ball. Johnny Manziel and Texas A&M threw for 11.8 yards per attempt against Alabama. However, that was the reigning Heisman trophy winner. I think their performance against Colorado State was worse. Even more strange, Alabama only ran the ball 39.6% of plays. Usually, they pound a lesser opponent into submission behind their offensive line. Not against Colorado State. I’m not ready to count out Nick Saban’s team, even if my noisy rankings have his offense 81st and his defense 96th. One game can flip these numbers dramatically. However, there is cause for concern. Mississippi comes to Bryant Denny this weekend. Alabama is a 16 point favorite, and my team rankings predict a 19.5 point win. But the noisy early season offense and defense rankings suggest that Alabama will not win by that much. Would it be possible for you to display your team rankings that uses data from only this season? At one point of the season do your normal reported team rankings stop using data from outside the current season? I understand that early in the season the data is noisy but I’m still interested in knowing who has performed and at what level without consideration of previous seasons.